Posted September 17, 2018 by Josette Farrell in Sport. Weekly Sellers Prize: Daniel Fox €2.00 per panel or 3 panels for €5.00 Win or share €200 for match three. Last draw was in the Summerfield Bar on Monday 17th Sept.
Ladies play Grainne Mhaols in their Championship on Wednesday week 19th at 8pm in Knockdoemore. Well done to the Senior Ladies who won the Senior Shield at the All-Ireland Sevens in Naomh Mearnog on Saturday. Claregalway suffered defeat to the Champions The Banner in their opening game but improved well over the day to claim second spot in their Group. In the semi-final they overcame a strong Shane O’Neill’s Team from Armagh and then defeated Moycullen in the Final on a score of 3-12 to 2-5. Well done to the U-14’s who were in Kilmacud on Saturday for their Sevens. Claregalway qualified out of their group for the cup competition but lost out to finalists Kilcullen at the knockout stage. 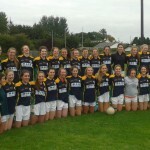 Good luck to the U-16 Girls who are in Championship semi-final in Corofin tonight Monday at 7:30. This follows their convincing win over Annaghdown last week. The second U-16 Girls had a great victory last week over St Michaels. The Juniors play Grainne Mahols in the Junior A Championship quarter final on this Wednesday 19th in Knockdoemore at 8pm. All support much appreciated for all our ladies games. In the Men’s Senior Championship Claregalway V Carraroe is at 3.30pm in Moycullen on Saturday the 22nd of September. Get on the colours and support the team in this big fixture for the club after the an impressive victory over Cortoon Shamrocks last time out. The Minor boys are playing Northern Gaels in Glenamaddy at 8pm on Friday September. 21st in the A Championship North.